The philosophy of mind is one of the fastest-growing areas in philosophy, not least because of its connections with related areas of psychology, linguistics and computation. This Companion is an alphabetically arranged reference guide to the subject, firmly rooted in the philosophy of mind, but with a number of entries that survey adjacent fields of interest. 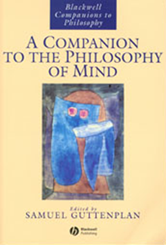 The book is introduced by the editor's substantial Essay on the Philosophy of Mind which serves as an overview of the subject, and is closely referenced to the entries in the Companion. Among the entries themselves are several "self-profiles" by leading philosophers in the field, including Chomsky, Davidson, Dennett, Dretske, Fodor, Lewis, Searle and Stalnaker, in which their own positions within the subject are articulated. In some more complex areas, more than one author has been invited to write on the same topic, giving a polarity of viewpoints within the book's overall coverage.